I am doing another makeup review, I really need to start doing outfit of the days though! 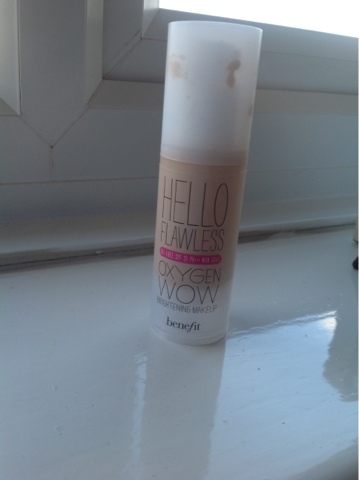 Anyway recently I've been trying out benefits hello flawless oxygen wow liquid foundation, in the shade honey. Before I review it I'm going to tell you a little about it. Okay so it is mineral foundation in a liquid form which is meant to be great for the skin, it's oil free and also contains SPF 25. Its also has a tri radiance complex which brightens up your skin, this is meant to give a light to medium coverage depending how you much you build upon it. I am not actually a fan of this foundation, I thought it would be great but it's just not. I'd say I have combination skin, and with the foundation being oil free i thought it would be perfect for my skin, but no. It feels soooooo greasy! It goes shiny and patchy nearly straight away no matter what I use before and after to get it to stay longer, if I wipe my finger lightly across my cheek it will leave a clear line of where it once was. It also makes my blusher and bronzer sit funny on the skin as well. The coverage again is bad I thought this would be perfect for more natural days but it just doesn't do a thing but feel slimey on your face! I put a whole pump on my face and it just didn't seem to change. On the plus side I got a tester for the bare minerals original SPF 15 foundation in medium beige, and it is amazing! 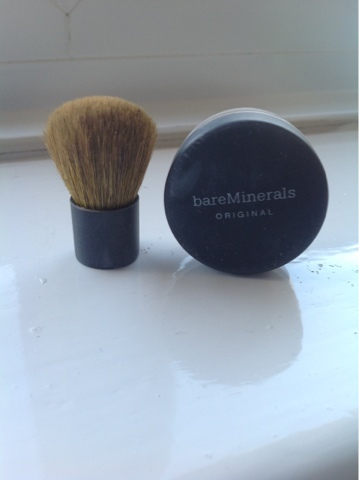 At first I didn't think much about it as I've never liked the though of a powder foundation. When I first applied it i was doing it all wrong but once I realised, the foundation looked flawless. It's great because you can have a range of coverages and it feels as if there is nothing on you. It also lasted all day on my face no patchiness yippeeeee! I'm defiantly going to invest in this foundation and I think you all should too! 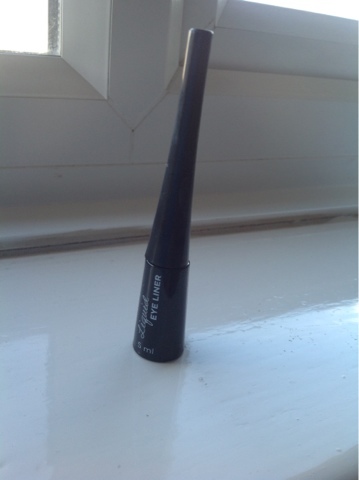 My last makeup item was only a £1, it is just a primark black liquid liner. I have been using the maybelline gel eye liner but find it prints on the top of my eyelid, so I got this once for a cheap replacement. And boy George is it good! 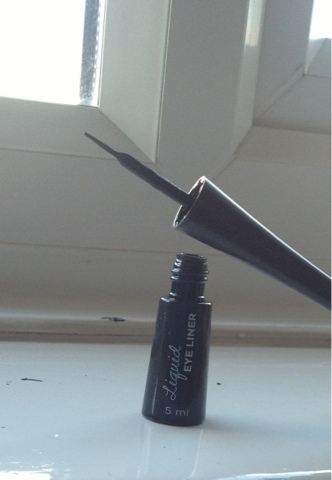 It has a nice fine flexible brush and the colour is a intense black which has an incredible staying power! I love it, especially with the price tag! What's your favourite makeup bargain?